The Architect ‘P’ Series superbly complements AudioControl’s popular high-power Architect Multi-zone amplifier series with an industry leading 100 Watts RMS per channel solution, skillfully engineered into a 2U Chassis. 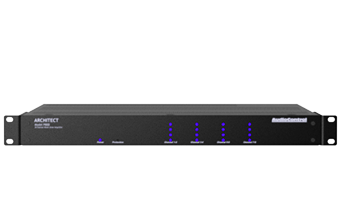 These new models are available with 12 or 16-channels and are designed and manufactured in the USA exclusively for the custom-installation market. Both models are available with or without AudioControl’s legendary equalization controls depending on the needs of the project. 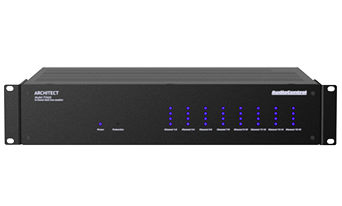 The Architect ‘P’ Series delivers over 100 watts per channel into 8 ohms, 200 watts per channel into 4 ohms; all channels driven. Additional adjoining channels can be bridged to 400 watts. The Architect ‘P’ Series uses a cool running proprietary design, including AudioControl’s LightDriveTM anti-clipping protection, input bussing capability, output pass-thru, master 12v trigger in/out plus local 12v trigger inputs on all zones, signal sensing as well plus digital inputs through a SPDIF input for digital sources.